Images of a long weekend. 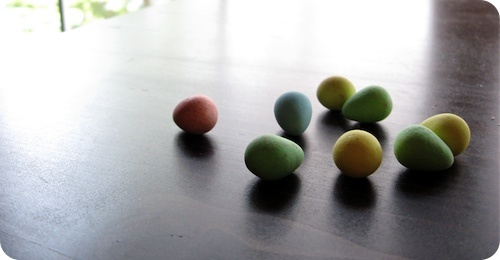 Signs of spring; candy-coloured chocolate eggs and blooming red shoes. I have my own little ritual to start the day. Most mornings we get up just before the sun rises; we make our way downstairs in the dim predawn, drawn like moths to the glowing red eye of the coffee maker. My husband and I will chat quietly with pajamaed little boys cheerfully groggy, (relatively) quietly content to keep Mummy and Daddy company around the kitchen table. But the day is not started yet. My day truly begins about two hours after I get up. After coffee and orange juice and breakfast, we make our way back upstairs. This is when the day begins, as I move from room to room, pulling back the blinds which have hidden the sun from view. The windows, now unencumbered, welcome the light as it streams in. This is the most energetic light of the day, clear and true. Even in the winter, I anticipate this moment of revelation, this ceremony of bringing the day into our home. Now that spring has thankfully arrived on our doorstep, the morning light is even more radiant, growing increasingly-golden as the days go by. It is a light that renders everything new, every day full of possibility. There is a newness to childhood that I had forgotten. So many things that we grow to take for granted is bran-spankin-brilliantly new to a little one. William is in the thick of it, crawling and standing and exploring the boundaries of this new world of discoveries. There is glee in the discovery of the ability to clap, wonder at the skill of rolling a ball, unabashed joy at knocking down a block tower. While our Benjamin has been through first teeth, first steps, first words already, he's not done yet discovering, not by a long shot. He's just getting started. At three years of age, he has entered the world of reason. He asks questions. A lot of questions. It is amazing to observe him as he considers his world. When Ben was very small, we were more concerned with the big picture, with labels like boy and dog and cat and apple. Now we also can consider the details, how he is a boy and a brother and a son and a Benjamin. And a bird can be brown and red and fat and a robin, too. The same sort of diversity is explored in food. As much as we rely on our established recipes, variation is welcomed. Eggs can be fried and scrambled and poached and omelets and boiled; they need not be only one way. Now and again I make it a particular point to seek out discoveries, just so I can see our boys process the new. I pretend to be casual, while slyly watching their expressions transform from curious to interested, then ponderous, and then finally wonder lights up their eyes - with this new thing, their world is forever changed. And it is marvelous. Often, their grins match my own. Lately we have been eating a lot of popcorn, since Benjamin declared it his favourite snack. We have always made it in relatively the same manner, with butter and salt, but sometimes with herbs and garlic or a grating of Parmesan. Curious to see his reaction, I thought I would try my hand at making caramel popcorn, one of my guilty pleasures and something he had never had before. Pressing my luck, I chose a recipe outside the realm of the usual caramel corn - one that was salty sweet, with a hit of spice to add some interest. Last Halloween we roasted pumpkin seeds then tossed them in a heady mix of cumin, cinnamon and ground ginger. They were addicting, and Benjamin was a particular fan. The result was more than I could have hoped for. At first the taste is sugary-sweet, then as the caramel dissolves the spices become evident. Each bite builds upon the savoury, but is never overpowering. My only trouble is, now that we've come upon this popcorn, I am not at all inclined to try another. I might have to abandon my good intentions, at least as far as popcorn is concerned. The publication in the photos is the ridiculously-brilliant Uppercasemagazine, from the exceptional minds behind the Calgary-based gallery of the same name. It is, in a word, gorgeous. This is their inaugural issue, and I highly recommend picking up a copy. You can thank me later. Speaking of magazines, have you entered your name in the giveaway yet? What you get when you mash up two recipes from Martha Stewart with a healthy dose of inspiration from David Lebovitz. Baking the popcorn makes for a thinner, crisper coating. This recipe is technically a half batch; I find it an easy amount to handle, especially as there is only a modest amount of bubbling, scorchingly-hot sugar syrup to worry about. However, if you are making this for a crowd, or for any more than say two greedy adults and a toddler, I'd go ahead and double the quantities. Preheat an oven to 250°F (120°C). Line a half sheet pan or baking pan with a nonstick baking mat (Silpat) and set aside. Have your popcorn standing by in a large, wide bowl. In a small bowl, stir together the salt, cumin, cinnamon, ginger, baking soda and chili powder. Set aside. In a medium, heavy-bottomed saucepan, combine the butter, sugars, corn syrup and water over medium heat. Cook, stirring occasionally, until the butter is melted and the sugar is dissolved. Without stirring, bring to a boil. If necessary, use a pastry brush dipped in water to wash down the sides of the pan and remove any crystallized sugar. Swirling the pot gently now and again, allow the sugar to cook until golden in colour, around 5 minutes. Remove saucepan from heat and, working quickly, use a heatproof spatula to stir in the prepared spice mixture. Note that the sugar will bubble up due to the baking soda. Allow the foaming to subside slightly, it will only take a few seconds, before proceeding. 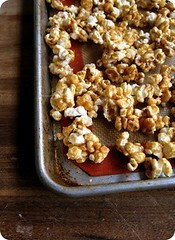 Quickly (and carefully) pour the caramel over the popcorn, stirring and tossing to coat. 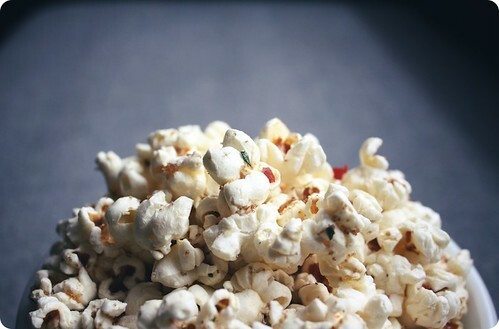 Spread the popcorn as evenly as possible over the prepared baking sheet and bake in the preheated oven for 30 minutes. 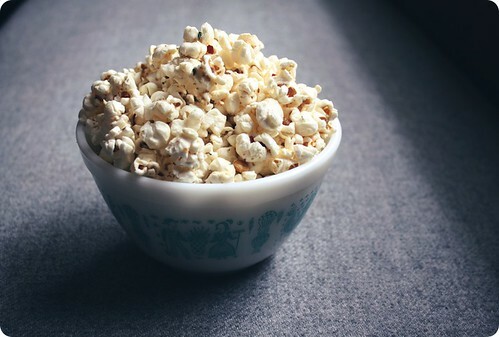 While baking, stir the popcorn occasionally, gently breaking up any large clumps and keeping the popcorn in an even layer. The last time you stir the popcorn, maybe about 5 minutes before taking the tray out of the oven, sprinkle with some fine-grained sea salt, if using. 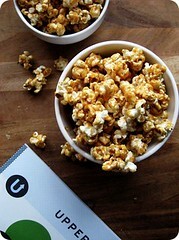 Allow the popcorn to cool completely on the tray, then break up any remaining large clusters. Store in an airtight container for up to 1 week. • If I had not been out of light brown sugar earlier this week, I would have followed David Lebovitz's suggestion of using it instead of granulated. • I use Kashmiri chili powder. • While I like my caramel corn unadorned, nuts would most likely be welcomed in this recipe. • See the link above to the Martha Stewart recipe for notes on popping popcorn on a stovetop.